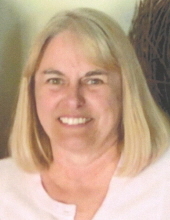 Linda G. Reinhart, 67, of Fostoria, passed away Monday, January 21, 2019 at the Cleveland Clinic. She was born February 20, 1951 in Alvada to Donald and Edna (Elchert) Nye. She married Florian A. Reinhart Jr. on June 19, 1971 at St. Boniface Parish. Survivors include her husband of 47 years, Florian (Jr); sons, Clifford and Jennifer Reinhart of Kansas, Timothy and Stephanie Reinhart of Fostoria, and David Reinhart of Jeffersonville, Indiana; and a daughter Tammy Brickner of Fostoria; and four grandchildren, Joshua Mason, Madelyn Reinhart, Mitchell Reinhart and Allison Brickner; her father, Donald Nye, New Riegel; siblings, Carolyn (Carl) Schalk, New Riegel, Dale (Dawn) Nye, New Riegel, Bonnie (Steve) Hohman, McCutchenville, Roger (Mary Ann) Nye, New Riegel and Regina (Dave) Wagner, Alvada; and brother in law, Ken (Linda) Bowers, Tiffin. She was preceded in death by her mother Edna M. Nye in 2014 and her sister Jane Bowers in 1993. Linda graduated from New Riegel High School in 1969, worked at General Electric, Steinmetz Accounting and Tax Service and worked alongside her husband with their family business. She was a former member of St. James Catholic Church in Kansas. She was a devoted wife, mother and grandmother (Nana). She enjoyed spending time with family, especially days spent with her grandchildren, but most of all she loved dancing with her husband. She enjoyed lunch with friends, attending parties, bonfires, baking, canning and her flower garden. She was a hard worker who enjoyed the outdoors and she was a loving and caring person who enjoyed outings spent with her husband. Visitation will take place from 2-4 & 5-8 p.m. on Friday January 25, 2019 at HOENING & SON FUNERAL HOME, 133 W. Tiffin Street, Fostoria and from 9-10 a.m. Saturday at the Church. Mass of Christian Burial will be at 10 a.m. on Saturday at All Saints Parish, New Riegel with Rev. Timothy Kummerer presiding. Burial will follow at St. Peter Cemetery, Alvada. Memorials are suggested to a charity of the family’s choice. To send flowers or a remembrance gift to the family of Linda G. Reinhart, please visit our Tribute Store. "Email Address" would like to share the life celebration of Linda G. Reinhart. Click on the "link" to go to share a favorite memory or leave a condolence message for the family.